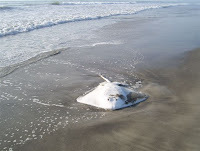 Our friend and colleague, Jim Angy, tells me that this is not a manta ray, but rather an Atlantic stingray. Manta rays are vegetarian, but the stingray will bite at baited hooks. 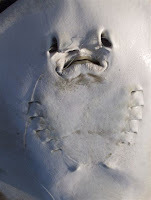 Fishermen cut the monofilament fairly far away from the stingray to avoid getting hit with the barbed tail, hence the monofilament wrapped around this stingray. Jim theorizes that this poor fellow died because the hook he swallowed punctured something vital inside. Clicking on the Atlantic stingray link above will take you to a page on the Mote Marine Laboratory website. Take some time and wander aound their site - lots of good stuff. We thank Ann Zscheile for sharing her fine photos and for her on-going devotion to the ocean's inhabitants. As we noted earlier, Ann is a tireless worker for the Sea Turtle Preservation Society. Be sure to click on the photos to get the enlarged images. :o( Why do people not carry out their trash instead of throwing on the ground? I see fishing line all over the place around lakes and ponds here as well as trash of all kinds.